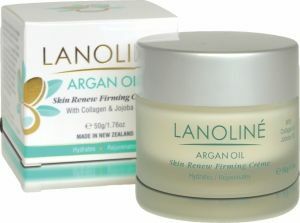 LANOLINÉ Argan oil Skin Renew Crème is an advanced skin moisturising crème containing matrix-derived peptides. Added benefits of Natural Argan Oil, Collagen and Jojoba Oil combine to assist in maintaining a balanced healthy and hydrated skin. Use day and night for a silky smooth complexion. Directions: Cleanse and dry the face. Gently massage into skin with fingertips. Ingredients: Aqua, Decyl Oleate, Prunus Amygdalus Dulcis (Sweet Almond) Oil, Stearic Acid, Glycerin, Glyceryl stearate, Isopropyl Myristate, Cetyl Alcohol, Aloe Barbadensis Leaf extract, Hydrolyzed Collagen, Argania Spinosa Kernel Oil, Helianthus Annuus (Sunflower) Seed Oil, Benzyl Alcohol(and) Salicylic Acid(and)Glycerin(and)Sorbic Acid, Triethanolamine, Fragrance, Simmondsia Chinensis (Jojoba) Seed Oil, Tocopheryl Acetate, Acetyl Hexapeptide-3, Citric Acid, Propolis Extract, Royal Jelly.